The DC Pad-8801, for lack of a better name, a third-party controller released for the Sega Dreamcast. 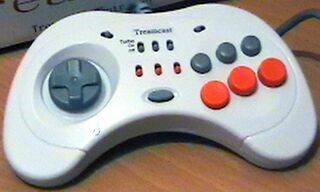 It was built to act as a replacement controller for the Treamcast clone console and is built identically, however unlike those found in the console package, these separate DC Pad-8801s have orange buttons and turbo switches. The design derives from the Sega Saturn control pad. On the plug there is a port for a single VMU. DC Pad-8801s are exceptionally rare and like the Treamcast console, are mainly found in the far East.